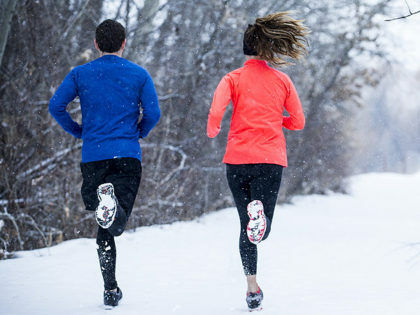 Crawl out from under that blanket this winter and reap the rewards of a cold weather workout! Although many of us put our regular exercise routines on hold during the colder upcoming months, here are a few reasons to rethink that idea and stay motivated to keep exercising this winter. First, according to research in Environmental Science and Technology, outdoor exercise can increase your energy and decrease tension, frustration, and depression along with greater enjoyment and satisfaction of the activity. These effects are intensified in the winter because your body has to work harder to exercise in cold weather which releases an increase in endorphin hormones and an invigorating boost to your body. Second, the outdoor winter exercise also helps you breathe more fresh air and exposes you to natural light and vitamin D. Many people are often lacking in natural light exposure during the shorter, darker days of winter, which can even lead to seasonal affective disorder or the ‘winter blues’ for some. Third, you can burn more calories in the winter! Research has found that the body will burn more energy when adjusting to cooler temperature changes, especially when we shiver. Some studies have also shown that race times are faster in cold weather than warmer temperatures and quicker runs burn more calories. There is such a thing as too bad of weather to exercise and you should stay in if you have to battle increased winds, snow, ice, or darkness because there are just too many challenges set against you. So, whether you’re walking or jogging in your neighborhood, snowshoeing the trails, or taking a trip to the slopes, it’s time get prepared and start enjoying your winter workouts and reaping the added health benefits! Know Your Route- Look for stable, safe footing as a priority when planning a winter route. Know which routes are plowed and well lit for morning or evening workout options. Try looking for a small loop in your neighborhood that you can repeat as many times as you want. If you become tired, slip, or get wet, you will still be close to home. Be Flexible- You may be a morning exerciser, but on extremely cold days, your best option is holding off until midafternoon, if possible, when temps are at their highest and paths are plowed. Dress for Success- In subfreezing weather, it’s important to layer your clothes with thin layers to keep your core warm and remember to cover your head and extremities to prevent frostbite and heat loss. It is also helpful to use a scarf around your nose and mouth to warm the air as you breathe. Warm Up Wisely- Before any workout, walk around or jog in place indoors for five minutes. When you head out, give your body time to adjust to the conditions by taking 30-second breaks every few minutes for the first 10 minutes. Start Small- If you normally walk or jog four miles in the summer, start with two. It’s better to ease into your workout to acclimate to the weather and be safer in the freezing temperatures if you have to stop. Take Cover- Try to avoid open roads and paths near water. Tree-lined trails and city blocks with buildings can help protect you from biting winds and snow flurries. Drink Up- You still sweat in the winter (especially all bundled up) so even if you don’t feel it as immediately as in the hot summer months, remember to stay hydrated! Cool Down- To avoid getting too chilled during your cool down, keep it brief and slow your pace for the final minutes, then go inside to stretch. Take off your extra layers and keep moving for a few more minutes before showering.